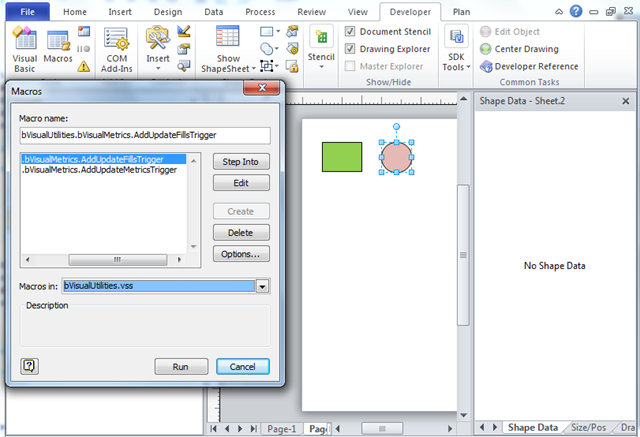 Everyone knows that you can change the colour of Visio shapes. Most people know that you can also change the fill pattern too. The actual formula for a colour though, may reference a particular theme, or it could be a number from the color map, for example 2 usually means Red (or RGB(255,0,0)). 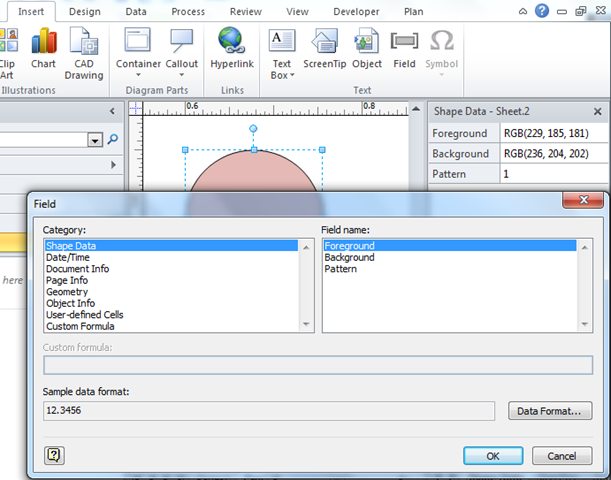 Some Visio users may wish to display the RGB values in Shape Data rows so that these values can be analysed or reported. Const actionUpdateCell As String = "Actions.UpdateMetrics"
Const fillForegndCell As String = "Prop.FillForegnd"
Const fillBkgndCell As String = "Prop.FillBkgnd"
Const fillPatternCell As String = "Prop.FillPattern"
Then, I added the AddUpdateFillsTrigger() to add some cells to the Page and selected shapes. 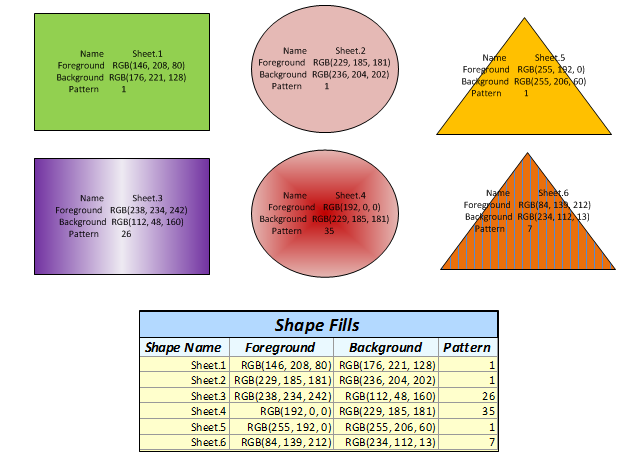 Finally, I added the UpdateFills() method that actually updates the Shape Data in the shapes whenever the FillForegnd, FillPattern or FillBkgnd values are changed. shp.Cells(fillForegndCell).FormulaU = "=""" & shp.Cells("FillForegnd").ResultStr("") & """"
shp.Cells(fillBkgndCell).FormulaU = "=""" & shp.Cells("FillBkgnd").ResultStr("") & """"
shp.Cells(fillPatternCell).FormulaU = "=""" & Replace(shp.Cells("FillPattern").FormulaU, """", """""") & """"
So, to use this, just Run the AddUpdateFillsTrigger macro whilst your desired shapes are selected. 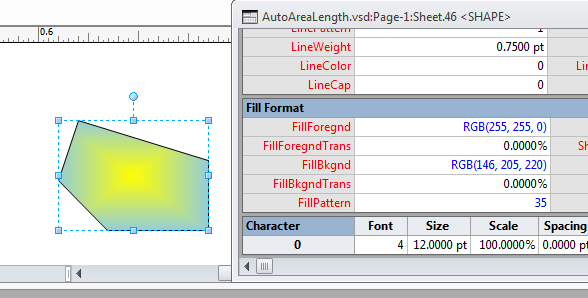 This macro will three Shape Data rows to the selected shapes, which will display the RGB values of the Foreground and Background, plus the formula of the Pattern. 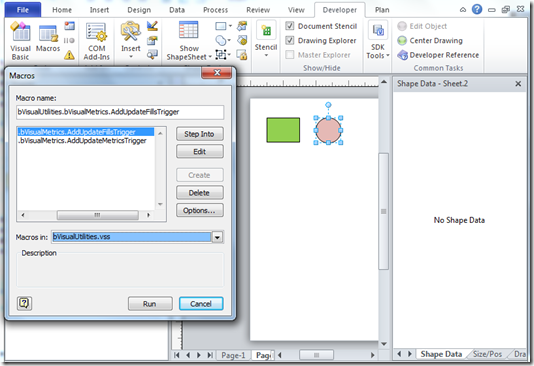 Not long now to the release of Visio 2010, but all of the code in this blog will work on any version and edition that I can think of. For colors from the Visio standard color pallet, the Foreground field displays the color’s number rather than its RGB values, e.g. 2 vs. 255,0,0 for red. Is there any way to force the Foreground field to always display the RGB values?